Offering low pressure air dryer, low pressure nitrogen dryer, fully automatic and computerized air handling unit for use in synthetic fiber, chemical process, air curtains and other industrial applications. Plant Capacity 1 - 10,000 NM³/Hr. Product Specifications Capacity : Upto 10,000 NM³/Hr. 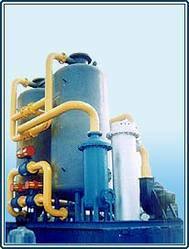 Process Description Compressed air is passed over a special grade of desiccant in twin tower system. While one tower is under drying cycle, air is passed over an electrically heated other tower and carries out the moisture of this tower. Similarly based on time cycle change over takes place from first tower to second & second to first. The operation is fully automatic. Nuberg Engineering Ltd is one of the most trusted Project Engineering & Turnkey Contracting organization, operational globally. It has a dedicated team of highly experienced and skilled professionals & engineers to provide world class turn key project services consisting of chemicals process know how, engineering design, procurement, implementation commissioning, in field of chemical, Petrochemical, Synthetic fiber etc. Nuberg is also India''s leading manufacturer of Nugen PSA Nitrogen Gas generators under technical collaboration with M/s. Rutgers CarboTech GmbH. We have in house facility and expertise for manufacturing of various Pressure Vessels, Reactors, Absorbers, Columns, Heat Exchangers, Tanks etc. At Nuberg, we have a sound quality assurance management system. We use the most modern software including Auto CAD, Vessels Mechanical Design - ASME, 3D Modeling of plant layouts by PDMS, MS office etc. to provide world class services to our clients. Our mechanical fabrication facility consists of well equipped work shop for manufacturing of Pressure vessels, Reactors, Columns, Heat exchangers, Tank etc. So far we have executed a tonnage of 40,000 MT. Our products & services have found leading customers in India, Thailand, China, Bangladesh, Oman, Egypt, Iraq, Iran & Uzbekistan. At Nuberg, we bring tried & tested engineering skills and experience to provide comprehensive engineering projects & services using most upto date & proven cutting technology. Nuberg''''s Competitive edge Single source of Process Development/ Project Engineering/ Construction of Plants. Very good understanding of Client needs. Quick customer response.